A number of support staff, including bus drivers, cooks and secretaries were rehired Monday night by the Henryetta school board. Board members held a 20-minute executive session to discuss the list of personnel that will be coming back when school resumes for the 2018-19 school year. Bus drivers: Christopher Ashby, Laura Black, Ronald Black, Nadine Graham, Michael Hardgrave, Ruby Jones, Tracy Kiehl, Alan Montgomery, Randy Stafford and Jim Wheeler. Maintenance/custodians: Chris Ashby, Kenneth Berry, Max Cline, Crystalyn Cook, Marshall Cook, Todd Crawford, Ralph Dennison, Jim Garrett, Gary Greenfield, Vernon Moore and Rhonda Morton. Cafeteria staff: Early Childhood; Glenda Ashley, Melissa Henley, Lela Foster and Deborah Johnson. Elementary: Paula Baughman, Kim Chandler, Kisha Gobin, Jennifer Lone, Nancy Wincle, Jill Hill and Ginny Parker. High School: Barbara Bussey, Sharon Beel, Laramie Goodwin, Dona Powell, Shannon Sneed, Tina Walters and Ashley Webber. Elementary support personnel: Pre-K Assistants: Laura King, Nikki Dwiggins and Winter Whitlock. Elementary assistants: Jamie Austin and Megan Clason. Early Childhood secretary Mary Craft. Middle School secretaries: Leslie Gillispie and Beth Potter. High school secretary: Melanie Green. 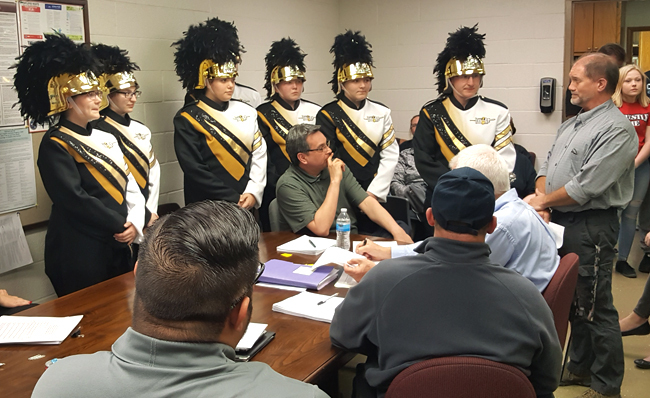 HHS band director Alan Montgomery brought in seven students dressed in the new uniforms. The gold and black attire, complete with gold helmet and black plume, arrived over the Christmas holiday period and will be shown at a yet-to-be-announced public venue. In other business, the board approved a resolution supporting teachers in the proposed statewide walkout April 2. Also gaining approval was the request to start a high school wrestling program next year. A resignation letter from Angela McGehee Ryals was read and approved. She will be leaving her position as elementary music teacher at the end of the year.